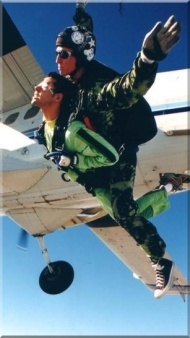 If you are looking for an unforgettable adventure in Florida, try skydiving Orlando. It is no surprise that Orlando, known as the theme park capital of the world, also has exceptional skydiving facilities. If you’re looking for an ultimate thrill ride, jumping out of a plane beats a theme park ride hands down. There is nothing quite like the sensation of freefall while falling from 12,000 feet at a terminal velocity of 120 miles per hour. Orlando Florida’s humid subtropical climate in effect has two seasons. The hot, humid, and rainy season happens from May through late September. During these months, afternoon thunderstorms can happen almost daily and therefore, late spring through summer is actually the least ideal skydiving season in Florida. If you skydive during these months, be sure to check the weather forecast because Orlando skydiving jumps must often be cancelled with inclement summer weather. Of course, you can always enjoy Orlando indoor skydiving year round. The best season to skydive Orlando is from October through April when the region is dry and pleasant with little rain, low humidity and calm winds. Florida is famous for its mild, even warm winters and January daytime highs average at 71 °F (or 22 °C). This makes fall, winter, and spring, the most ideal seasons to skydive in Orlando. Check Groupon for Local Orlando Skydiving Discounts up to 90% off! The city also hosts exceptional indoor skydiving facilities. Orlando indoor skydiving facilities safely create a freefall experience without the terror of actually jumping from a plane and falling towards the ground. 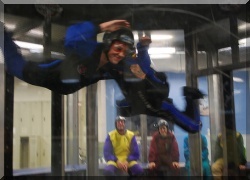 Also, indoor skydiving requires very little preparation and can be enjoyed no matter how the weather is outside. iFly Orlando (6805 Visitors Circle, Orlando, FL 32819) is one of Florida’s best indoor skydiving facilities and regularly offers half-off discount coupons. Other facilities also offer limited-time coupons. Before planning your indoor skydiving at Orlando, be sure to check if any coupons are currently available.